Summer is here, at least for some days. This is actually a very sad statement when it’s already end of June / early July. But this year we decided that no rain or temperatures over 20°C are absolutely great weather so far, so we are making the best of it. 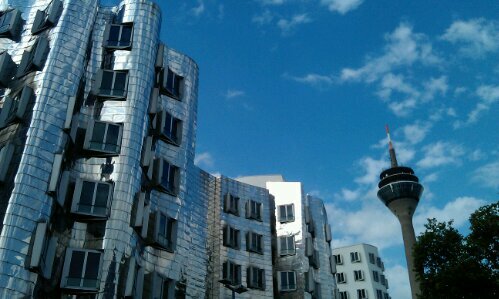 Last weekend was like this: all sunshine and high temperature. And as Tine was over from Brussels we decided to do a little bike tour. I had just bought a new bike that week, already preparing for our bike tour in the Netherlands in late August, so we had two bikes and actually we wanted to go to Kaiserswerth, a cute little northern suburb of Düsseldorf. But as the weather was so good we decided we’d go to the beach instead. When we arrived on the beach it unfortunately got a little cloudy (this is why there are no pictures here) so we didn’t stay too long. but yet it is still funny to see kids playing in the water, even though I’m not sure if I’d let my kids play in the water there. Rhe Rhine (pronounced in German it sounds like “rein” which means clean) is not know for being so clean. But well, it didn’t seem to do those kids any harm and we had a short rest, reading a bit and nearly falling asleep. 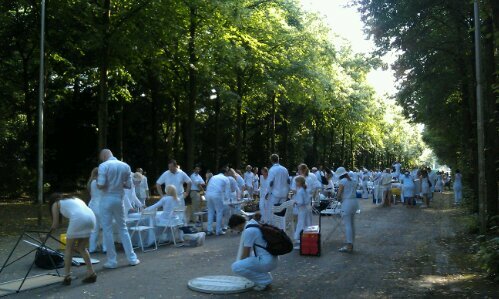 On our way back we finally witnessed a funny event that took place in Düsseldorf that day: a picnic in white in Düsseldorf’s Hofgarten, the central park in Düsseldorf. 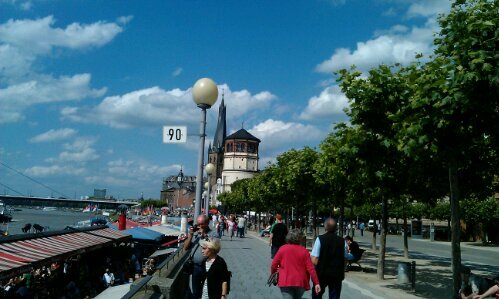 This entry was posted in Germany and tagged Beach, Bike, Dusseldorf, Park, Summer by kathatravelling. Bookmark the permalink.